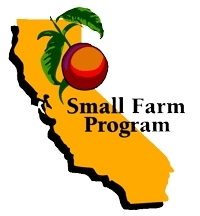 The UC Small Farm Program helps small-scale farmers through research and education as part of the University of California's statewide division of Agriculture and Natural Resources. We develop field and marketing research aimed at the needs of small- and moderate-scale farmers, and provide that information to farmers who are often not reached by traditional extension programs. Our clients include farmers of many different cultures who operate a wide variety of farming operations, often with limited resources. The program works with topics related to specialty crops, marketing, agritourism, food safety, healthy environments and business management — as they relate to California's small-scale farmers.